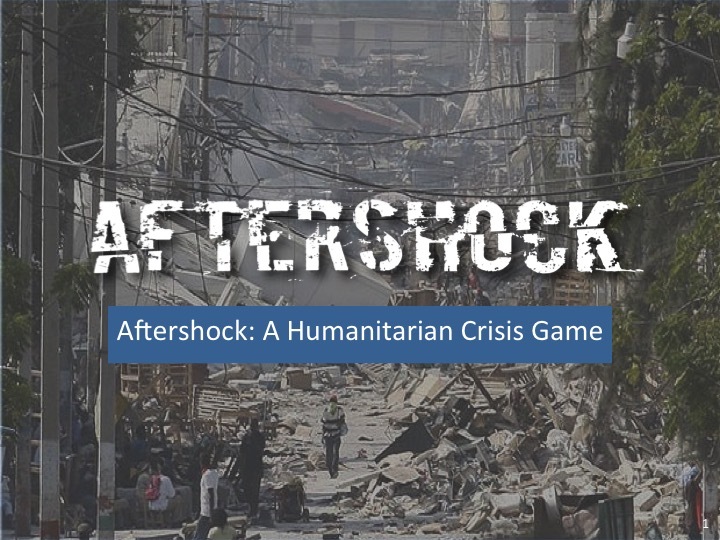 Yesterday, a group of us from McGill University ran four simultaneous games of AFTERSHOCK: A Humanitarian Crisis Game for around thirty students in the 2014-15 Canadian Disaster and Humanitarian Response Training Program. This program offers evidence-based training on the globally-recognized core humanitarian competencies. It is intended for those with little or no prior field experience who wish to undertake a professional career in the humanitarian sector. Eric makes sure his game is ready to go as participants listen to the pre-game briefing. We also provided players with an overview of the turn sequence, and the strengths, weaknesses, and special objectives of each of the teams (the host country of Carana, the United Nations, international NGOs, and the third-country military forces of the “Humanitarian Assistance and Disaster Relief Task Force” sent to assist). As a deliberate teaching strategy we did NOT try to acquaint players with all of the rules up front, since this might have overwhelmed neophytes. Instead, the game is much more easily learned by playing it step-by-step. Experience suggests that, after the first turn, most people understand what they are doing. Hiba is ready to go too! Players then reported to their pre-assigned game table, forming teams of 1-2 for up to eight players per game. 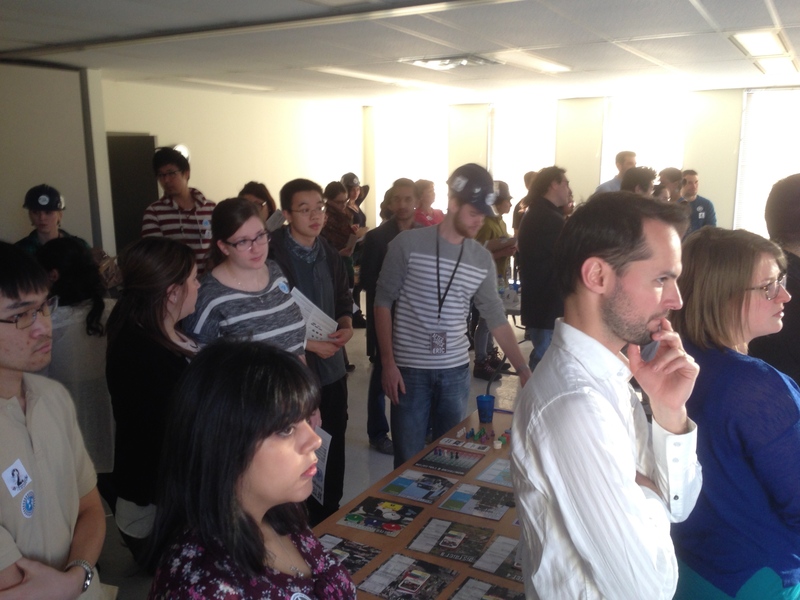 Each game was run by an experienced McGill graduate student, while myself and co-designer Tom Fisher circulated around the room helping with game play and relating what was happening in-game to real-world disaster relief. We used the two-hour timed version of the game, which includes scoring bonuses for reaching certain benchmarks within certain time limits. This not only guaranteed we would could deliver the entire game within the 2.5 hour class slot, but also has the very considerable advantage of generating a real sense of urgency during game play. June talks players through their first turn. At first it was all rather chaotic, with players learning how the game worked and starting to coordinate between teams—a key part of effective game play. Many Caranans died in the first 48 hours or so of the disaster. That too was part of the atmosphere we were looking to achieve: an initial sense of being overwhelmed by the confusion and sheer scale of the disaster, but with actors slowly beginning to make some headway as priorities are set, scarce resources are allocated (and others arrive on-scene), and multiple actors begin to work cooperatively around shared strategy. 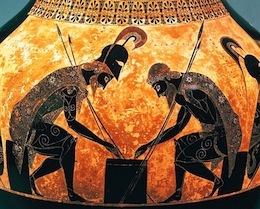 Over time, a real sense of camaraderie developed in each game: players cheered their successes, collectively groaned at failures or adverse effects, noisily debated strategy, and urged each other to act promptly. Occasionally some tensions arose between the slightly differing priorities of each team. At times host country leaders grew annoyed that they weren’t always being listened to by the outsiders who had come to help. Three of the four games resulted in overall success, two by a substantial margin and one rather more closely. With the exception of one HADR Task Force contingent that ended up over-committed, all of the individual teams in these games won too. Ecem has a player draw cards from the Coordination deck—one of the advantages of attending humanitarian cluster meetings. Players in the fourth game were unsuccessful. However, they were especially unfortunate: the initial earthquake was followed by a very severe aftershock only 72 hours later, which in turn was followed by heavy rains and flooding just a couple of days after that. As if that wasn’t enough, a severe cholera outbreak then devastated the slums of the capital! Social unrest became widespread, forcing the government to devote scarce resources to deescalating tensions and restoring public order. Much of this was the result of some frankly very unlucky card draws, but there was a teachable moment in that too: natural disasters and other humanitarian crises aren’t “fair,” and sometimes actors will need to deal with a series of setbacks largely beyond their immediate control. 1. How enjoyable did you find the game? 2. 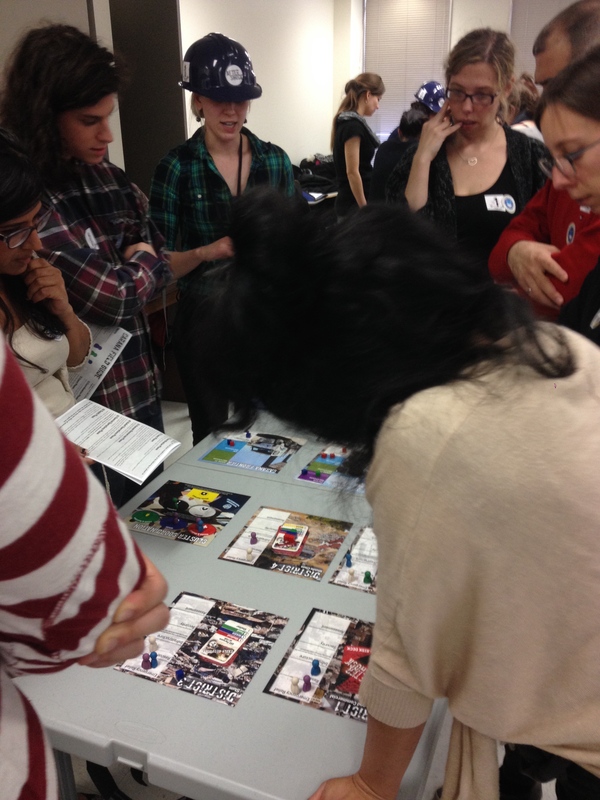 How well did the game illustrate themes related to humanitarian assistance and coordination? 3. Were the rules too complicated, too simple, or about right? 4. Should the game be used again for this course in future years? These are similar to the results we’ve received when we’ve run the game with university students at McGill. 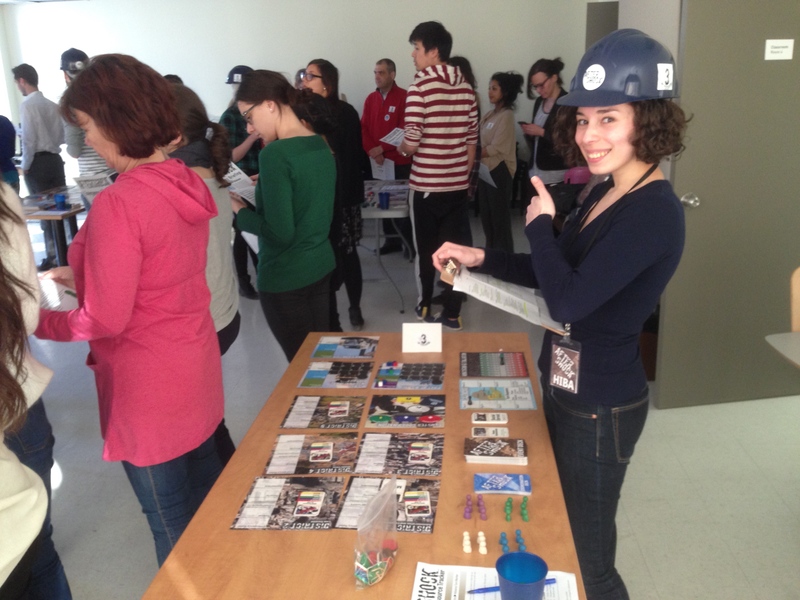 We’ll be running the game again for another Canadian Disaster and Humanitarian Response Training Program class in May. 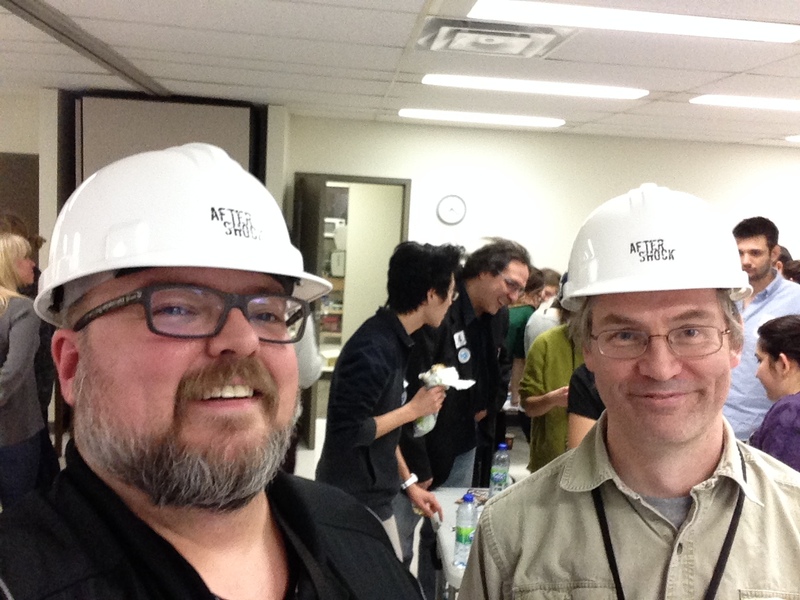 Tom and I—in white helmets, of course.